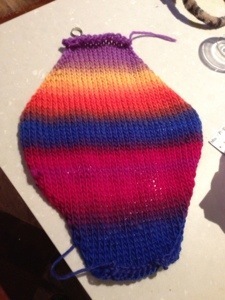 Dammit, is there a Knitting Bandwagon now? Well, then I’m on it. Because today I discovered that you can knit at the movies. Especially if its a kids movie that you’ve already seen and are only going to shut your daughter’s high maintenance friend up from complaining about her sister. 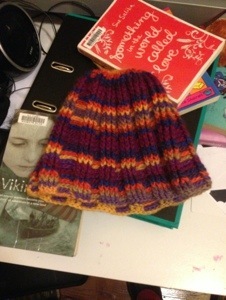 I should first mention that I finished the crocheted beanie and the Muffet only takes it off to go to bed. I’m rather pleased with it. The Horror originally wanted an identical beanie, but then picked up a Tardis one at Supanova. 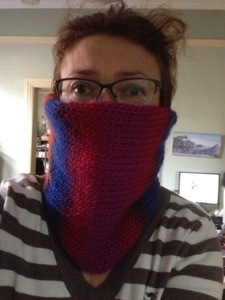 So, as we’re going skiing the week after next he requested what is essentially a cowl. He wanted to be able to pull it up over his face, to be able to breathe through it and for it to stay in place once he’d put it there. 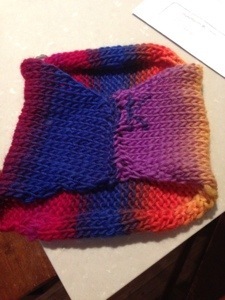 The easiest way to do this is to just knit a rectangle and sew the short ends up. But there’s a whole lot of bulk at the back of your neck when you’re skiing, the collar of your jacket, a helmet in the Horror’s case, a ponytail in mine. So I decided to make it narrower at the back. What I did was to start off with twelve stitches on size ten needles. Then a row of purl. Then alternate knit and purl rows and increase every knit row by a stitch either end. When I got to a width the stretched from the bridge of my nose to the bottom of the V neck of my jumper I stopped increasing and just knitted and purled on for a while. By the time the movie had finished I was decreasing and finished the thing before it was time to pick up the Horror from his little friend’s place. He said it was far too big for him, so I’ll keep it for myself, thank you very much. Knitting his smaller one only took me about an hour. Here’s what it looked like before sewing the ends together. And with the ends sewed together. Yes, his name does start with a K.
He tested it fairly thoroughly, tried it in different positions, breathed heavily through it and pulled it up over his whole face to discover he could see through it, it’s quite a loose knit. He finally declared himself satisfied, he’s a tough audience. Now we won’t have to put up with any complaints about facial discomfort in the snow. Also now I can start on a new crochet pattern I have. It’s a round beanie with a wide turned up brim that I’m going to do in black and white for watching the boys play soccer. I may have to go yarn shopping again soon, there’s a place in town that looks rather exciting. After the kids go back to school, after skiing. That is if I can still walk by then, but of course I’ll be able to, what kind of talk is that? Just because last year’s trip resulted in what is now a full year of ankle treatments, that has no bearing on this year’s trip. None at all.